Cross Training is one of the most popular fitness systems in the world. It is a big improvement over machine based systems. Most Cross Trainers come to us when they realize that their program lacks sufficient variety in movement and emphasis on efficiency. They want to offer this additional study to their clients. 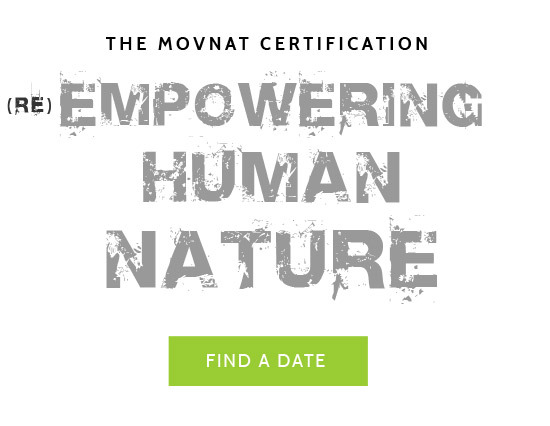 The high intensity of the Cross Training world is perfectly complemented by the foundational natural movements, skills and techniques of MovNat. What you learn you can implement. In between reps of pull-ups you can practice balancing moves. Replace the omnipresent pull-ups by forearm pull-ups or tuck pop-ups. After intense weight training, shift gears to do a specific, technical jump, or practice a specific jumping technique before a metcon involving plyo box jumps. Incorporating complex, adaptable movements and fresh, new physical challenges engages new parts of your clients mind and body, leading to increased competency and performance. Offer new physical challenges, something fresh and enjoyable, besides the same old WODs. 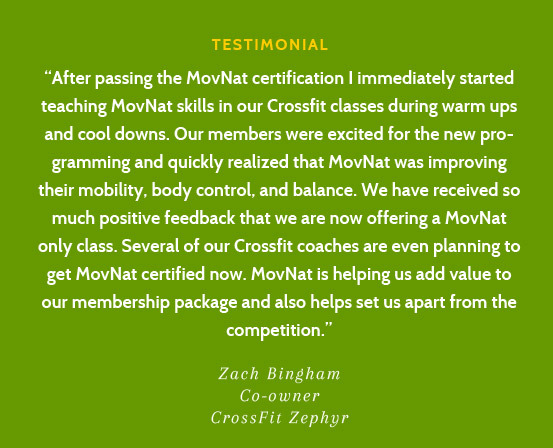 Help clients with their mobility, coordination and balance issues by practicing varied fundamental natural movements absent from the Cross Training program. Add mindful, technique and efficiency based movements that engage your clients on a different level than just high intensity. Specific movement skills and technique classes for anyone considering an obstacle race, as our system is essential for this.